This breed descended from the Eastern Graylag, which is why true Pomeranians have pinkish red beak, legs and feet. The Pomeranian is believed to have developed in the Pomorze region between the Rivers Odes and Vistula. It is an ancient breed that has stood the intrusion of foreign and modern breeds into its home turf and contributed to the development of numerous breeds and varieties, and proven itself competitive where ever tried. Today it is the dominant breed in Northern Germany, Poland, Slovokia and the Czech Republic. It is very popular in the rest of Germany and Austria and seems to be gaining elsewhere. More than thirty years ago I encountered representatives of the breed in Switzerland, the Low Countries and Britian, as well as its more typical range. Despite what Soames and other writers have said, when I was in Germany in the early 1970's I had the distinct impression it was the dominant working goose everywhere. Other geese may have been prominent in the southern shows, but the goose most commonly encountered in the German countryside was the Pomeranian. Oscar Grow considered the Pomeranian "basically a commercial breed, as it has always been developed along practical and easily followed lines." Historically it is also a stylish medium sized breed that has become increasingly popular as a show bird. The Pomeranian comes in a variety of colors and patterns. Historically the Grays were the most popular, but in the later 20th century the Saddleback (both Buff and Gray) became the more popular type. It has been suggested that this was a result of their dressing off better than solid gray birds. Since the White variety was also developed very early but did not show a similar surge in popularity, it is probable that most of the increased popularity for the Saddleback is due to an interest in the pattern. The Pomeranian or its group seems to be the original source of Buff in other breeds, but in Germany solid Buff geese are called Celler geese. Elsewhere they are usually called Buff Pomeranian. I have also seen Blue in Pomeranian flocks that has proper type and pinkish red extremities. I would think Blue has the potential to become popular both in the Saddleback and solid patterns. Blue Pomeranians may contain some Steinbacher genetics (another German breed with a different type and orange extremities). Most of the numerous Pomeranian varieties seem to have long histories, which is probably a function of the breed's ancient history. In Germany, and to a lesser extent elsewhere, working commercial flocks commonly have a variety of patterns and colors. Pomeranian geese have a long American history dating to early German settlement. It was probably the 2nd most important North American breed after the Grays. Less than 40 years ago the Pomeranian was still common in rural areas that had been settled by Germans. Until APA recognition of the Saddleback varieties, Pomeranians have often been called German Geese in parts of North America, or simply Geese by the German Americans that most commonly raised them. Recognition by the APA of only the Saddleback varieties has given some Americans the decidedly wrong impression that Pomeranian means Saddleback and that all Pomeranian geese are Saddleback, and conversely that all Saddlebacks are Pomeranian. The passing of the traditional family farm and the decline of the important role of the goose in American agriculture have made this once common breed a rarity, and an important SPPA project. Sadly many American show "Pomeranians" are not genuine. Some have been made of whole cloth by crossing Embdens and Grays and others have Embden added to Pomeranian blood to increase size. In either case the result has been birds that are not representative of the historic type in size, type or the color of the extremities. (The APA Standard requires "orange red" extremities, rather than the original pinkish red). The situation with the Pomeranian in America has led some writers to assume that they are the result of a recent cross between Embden and Toulouse. Oscar Grow spent considerable time refuting such an idea. My old friend Bruce Lentz simply remarked, "Anyone who knows anything about geese knows that can't be the case. Not only are size, type, and leg and bill color wrong, there were Poms before anyone even thought of Toulouse or Embdens!" As far as Saddlebacks go, in addition to Pomeranian and non-Pomeranian American saddlebacks, there are English Saddlebacks, Saddlebacks in the Danubian group and a whole group of Scandinavian Saddlebacks, including Smalen Geese, Olandsgas, and Seania geese. Not only has it been suggested that Saddlebacks are the result of crossing Grays and Whites (one way that they can be produced with a little selection), but it has also been indicated that they are midpoint in the production of Whites. 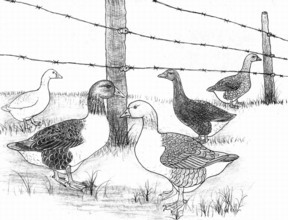 There is some truth here, as occasionally Saddleback geese produce White. But both White and Saddleback individuals appear as "sports" in wild populations. White seems to be more common, but this may be due to the fact that they show up better at a distance. However you want to say it, this is a unique and ancient breed worthy of preservation. It is prolific and has the ability to make good gains on forage. My limited experience at dressing geese supports Barbara Soames's assertion that "all geese with pink colored extremities tend to dress off very well."